Why The Equivalence Between The 2 Flags? at all is way off base when it comes to grasping the symbolism of that historically and morally discredited piece of cloth. The folks (at least those who support the city's official position) living in Gettysburg, South Dakota, a city that was founded by veterans of the Civil War in the 19th century, argue that the flag is representative of the city's heritage and therefore should have equal exposure with the flag of the United States of America on the PD's official crest. There's probably some merit to that point, but by emblazoning their city police force's official seal with it they apparently take some measure of pride in their identification with that symbol of slavery, not to mention contempt for the very idea of the Union itself. This says much about the city's official lack of understanding and sensitivity. For crying out loud, can't the citizens of Gettysburg understand how deeply minority populations are offended by a flag that represents the inhuman treatment and subjugation of one of our country's largest minority groups? No Room For The Confederate Symbol Here. Why Festoon The Police With It? on it and draw their own conclusion. The Constitutional argument that I would make is one that allows people freedom of speech. Given the virtually limitless freedom to use the Confederate flag in all manner of official and unofficial capacities, I'd say the long history of its display is one that has de facto Constitutional sanction. Just as there has never been a serious federal attempt at getting the State of South Carolina to remove the flag from state property, it seems pretty doubtful that any outside entity, public or private, can force Gettysburg to ban the display by using Constitutional authority. Fact is, it would be contra-Constitutional to do so. Freedom of speech is also the freedom to make stupid utterances (some of my readers probably marvel at my frequent capacity to do just that, lol), which is exactly the lesson that we learn from Gettysburg, South Dakota, and its irrational infatuation with the flag of the Confederacy. The Anti-Corruption Law Proposed For South Dakota? I'm Supportive. I'm Hopeful. I'm Dubious. given. 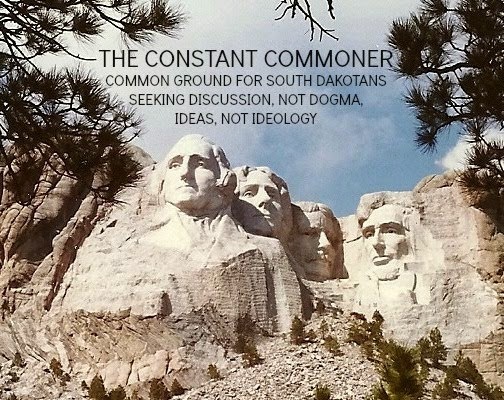 That some folks here in South Dakota are actually making an effort to overturn that status quo is a grand departure from rhetoric, a noble venture into action. A group calling itself "South Dakotans For Ethics Reform" has just put together a proposed amendment to South Dakota's constitution. Called The South Dakota Government Accountability And Anti-Corruption Act, the proposal will soon be seeking enough signatures to turn it into an intiative that will appear on the November, 2016, ballot. Its sponsors say the amendment's intent is to "prevent political bribery, improve transparency, and increase enforcement of South Dakota's ethics laws." There is one aspect of this venture that is most noteworthy now, during its inception phase. It's the conspicuously bi-partisan nature of its supporters. Well-known Republicans Don Frankenfeld and David Volk have joined up with Democrat Rick Weiland to give the campaign a broadly supportive kick-start. The effort will get plenty of attention around the state and at the very least will start a lot of conversations about reform. Republicans who are dismissing it (one writer calls it "a 44-page monstrosity") do so at their peril, because I think a lot of people in both parties are fed-up with the influence of big money, generally, and the lackluster attention to ethics in South Dakota, specifically. On the latter front, the ridiculously casual effort by our legislature to get to the bottom of the EB-5 scandal that probably cost South Dakota more than $100 million dollars likely put ethics code enforcement issues at the top of our collective political mind and spurred much of the effort on this new initiative. Are The Reformers Tilting Futilely? that to me seems to have nothing to do with campaign and ethics reform. If you go to the link I provided you'll see a clause about empowering voters and small donors by creating a pool of public money to provide them with up to $100 each to be used as donations to state candidates, who "would demonstrate robust community support and commit to raising small contributions from South Dakota residents." Essentially we're talking about public funding to the tune of millions of dollars for political campaigns, and this is where the initiative is likely to bog down. South Dakota taxpayers, me included, will have a tough time going along with the notion that their money should be used to support political aspirants. The state isn't flush enough to direct its meager cash resources at yet another interest competing for the money. Much as I like transparency, contribution limits, disclosures to the max and the general thrust of meaningful reform--and much as I'm willing to engage in some discussion and consideration of public financing for candidates--I think inserting that element into this proposed amendment is a poison pill. It's all very frustrating to me because without that clause, this effort has a real chance. As it is, much of the discussion about it will focus on the public financing aspect, which is gratuitous and irrelevant to the broader reforms set forth by the writers. That discussion is likely to torpedo this otherwise outstanding vessel for real reform in South Dakota politics.